So how was September for you? Did you blink and miss it? Mine has been pretty busy. These days I'm juggling the family business, freelance writing and my blog, and sometimes it feels like a pretty tall order to do all three as well as I would like. I'm not going to complain though - it's good to be busy! 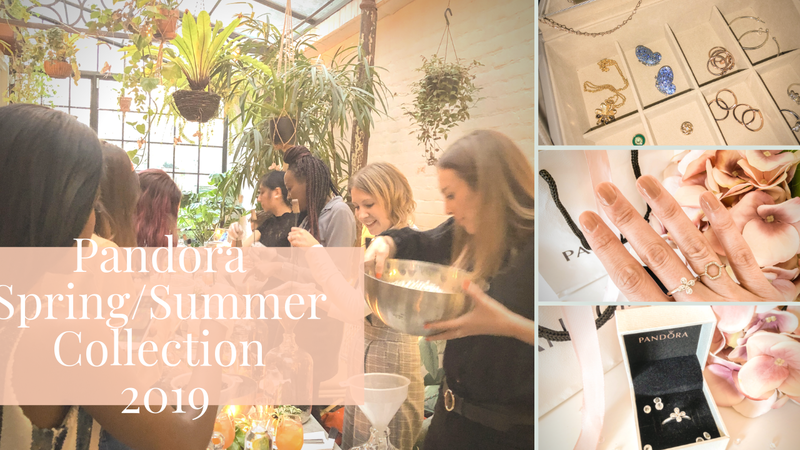 I did also find time for one or two interesting events this month. 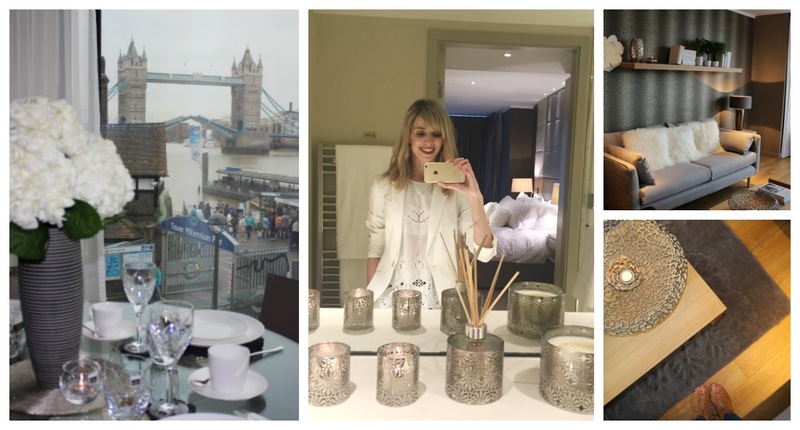 I went to the John Rocha takeover at the swanky Cheval Three Quays apartments with Debenhams - think gorgeous homeware with stunning views of London. Closer to home, and totally non blog related, I got the opportunity to see a presentation by Ben Parkinson, a British soldier who was so badly injured by a mine in Afghanistan that doctors didn't believe he would survive. Not only did he survive, but despite losing both legs, breaking his back and suffering brain damage, he has gone on to undertake all kinds of challenges to raise money for other injured soldiers, including kayaking 250 miles down the Yukon River in Canada. It was both moving and inspiring to learn more about him. I didn't get any photos of the event - it wasn't really appropriate - so apologies if it seems a bit random to throw it in here. I just wanted to mention it because it made an impression on me, and I thought some of you might be interested too. If you want to learn more about him you can do so here. So onto my monthly favourites. As usual, it's a random mix of fashion bits, makeup and skincare. 1. Topshop Mules - Yep, it's those mustard mules again. As seen here as well as all over my Instagram. I apologise to anyone who's sick of the sight of them! I absolutely love these. They're on trend, eye catching and comfortable to wear, and I've been getting as much use out of them as I can this month, before it gets too cold to wear them other than in a "car to bar" situation. And I think I ought to mention that I can't get the burgundy ones out of my head either. Topshop, what are you doing to me?! 2. Barry M Molten Metal Nail Paint in Copper Mine - I bought this specifically to go with the dress I wore in this post, but I've found myself turning to it quite a lot since. Shimmery metallic nails are always fun, and there's something nicely autumnal about this rich copper shade. I thought I'd keep it for special occasions, but I've actually been enjoying it as an everyday nail polish too. 3. Topshop Necklace (similar here) - I've been loving the unusual style of this delicate gold necklace. It looks like a lariat necklace, but actually fastens with a clasp at the back. I've worn it over plain tops (you might just be able to make it out in the mirror selfie above) or peeping out underneath a shirt collar. It looks great both ways - feminine and pretty and a little bit different. 4. Topshop Choker - Maybe it's the nostalgia, but I'm enjoying chokers even more this time around than I did back in the nineties. There are so many gorgeous variations on offer - studded, all lace, thin leather ties - but I still really love the classic black velvet band. Looks fabulous with dresses, jeans and a white shirt or just about anything really. 5. Palmers Cocoa Butter Formula Firming Butter - For years I've loved The Body Shop's body butters, and I still do, but seeing this post on Fashion Mumblr - one of my favourite blogs - persuaded me to give this a try instead. I really love it! It's as rich and moisturising as my old favourites, and has the added bonus of containing firming ingredients such as Vitamin E, collagen, elastin and shea butter - and yes, my skin really does look and feel firmer after using this. It's got that gorgeous cocoa butter scent to it, and is a lot cheaper than The Body Shop body butters - just £5.24. Even the fact that I managed to pick up a bottle with a dud dispenser and have to unscrew the whole bloody thing every time I use it hasn't dampened my enthusiasm for this product. This one's going to be a favourite for a long time to come. 6. Ekia Eyelid Lifting Serum* - I'm sticking with the firming theme for this one. This was in the goody bag I picked up at the Pegasus Healthy Beauty Showcase earlier this year and I've only just started using it. I would probably never have bought something like this myself - in fact, I don't think I knew there was such a thing as eyelid lifting serum! But it's really good. Those of you in your thirties like me may have noticed the skin on your eyelids becoming slightly less firm - maybe it pulls a little more than it used to when you apply eyeshadow? This has made a noticeable difference for me in that area and I will definitely keep on using it. 7. 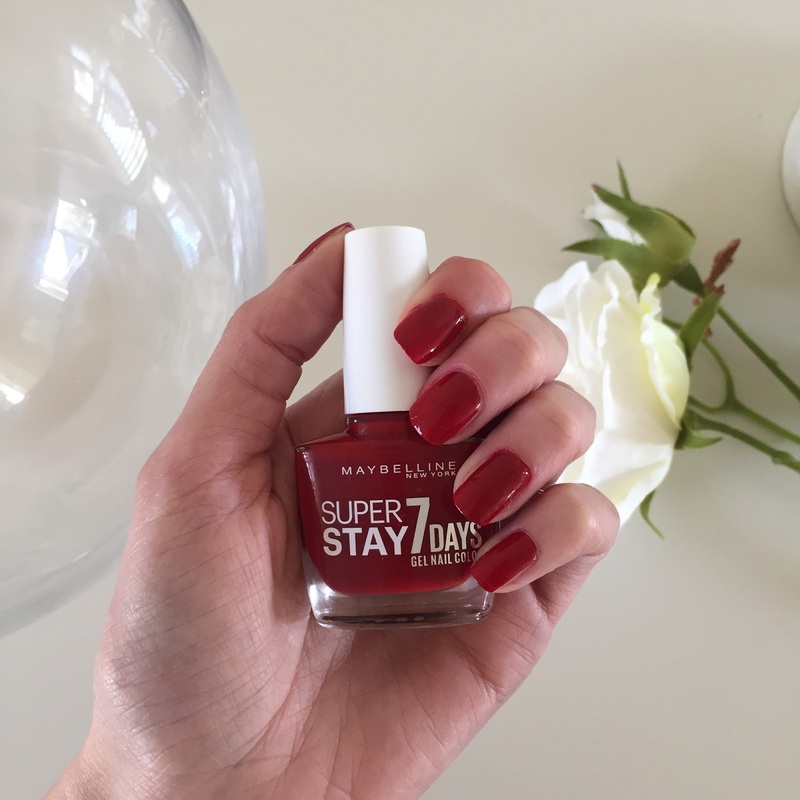 Maybelline Super Stay Nail Polish in Deep Red - I featured one of these nail polishes in my August Favourites, so I think it's safe to say I'm hooked! The formula is fantastic, application is easy and the finish is glossy - in the photo above, I'm wearing two coats of the nail polish and no top coat. This shade is the perfect red and I'm sure I'll be wearing it to death throughout autumn and winter. Ooh I love the look of the Barry M nail molten metal polish, such a beaut and so perfect for Autumn! I haven't done a favourite post since months! LOL! I kept telling myself that I need to try the Maybelline's nail polis, I think Dagmara loves them too but just never got around to it. The Maybelline polish is gorgeous, can't wait to start wearing darker shades for Autumn again :) The Ben Parkinson presentation sounds very inspirational, I like survival stories like that. I watched the one on Ted Talks of the lady who escaped North Korea - really puts things into perspective! Those shoes are gorgeous, I need them! These favourites are absolutely amazing - totally digging those mustard shoes, they're so pretty! And how amazing is that London hotel view?! Seems like you had a blast of a month! I've been eyeing up the molten metals range from Barry M for a while now - I'm not sure what it stopping me! I'd also love to get in on the choker range but I feel quite nervous about it, I feel like it won't suit me gah! Lovely choices. Love those yellow Top Shop Mules. That maybelline nail polish looks amazing! Im dying to try it! Thanks for sharing! September was such a busy month! Love how you managed to find some time for some favourite though, that nail polish is gorgeous! Love both of the nail polish shades you have here, they're so pretty and perfect for Autumn! Ben sounds like such an inspiring and strong person, the presentation must have been really amazing to see! Ah hun - this is a such a lovely post and I agree with you, it's good to be busy although it can sometimes get overwhelming when you've got a lot to get through!! Well done though! How gorgeous are th view of London and that sounds like such a wonderful event but the other event with the soldier - it's things like this which really make you appreciate what you have (thats what I think) as you see what other people appreciate and what other people would give to be in your position. It's inspiring hearing people's stories and seeing what they've gone through and puts things into perspective - there's so much to be grateful about and we often take little things for granted. Lol - a bit of a long comment, I do get carried away! I thought September flew by too! I love that Barry M nail colour! That nail polish loos gorgeous, such a beautiful shade! I completely agree, September went by so fast! What gorgeous photos! And I totally agree...September totally FLEW by! Great selections! September flew by so quickly, I don't know where the time has gone! I really love that nail polish, such a lovely color! iIm loving the molten metal nail polish, gorgeous, as I'm still so into metallics this year. I'm not sick of the sight of your mustard mules, just jealous as they're fab! Fab post. Great selection. I completly love your nail polish, such a nice colour.